We have the only crane in the world which can pick up and deposit a closed bottom (Australian) pallet on & off selective racking without the need for fork-entry bars. 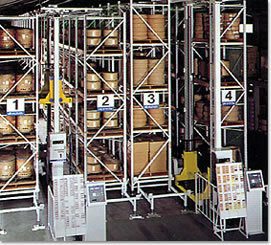 We can provide ‘Automated Systems’ in place of ‘Sealed Warehouse’. Full range of Stacker Cranes: Straight aisle, Loop or aisle changing cranes in single-deep or multi deep. Can provide ‘Sealed Warehouse’ suitable for General Storage or Controlled Environment. Pallets / Barrels / Boxes stored independently with immediate access to each. No Block Stacking – No damage. Automated ‘Order Picking’ Brings the Pallet to You. Computer-controlled cranes – no human error. No humans, no forklifts – cost savings over time. … results in less shrinkage, less cost, better quality and therefore more profit. Technical documents are available including specifications with costings*. Please Contact Us for more information.